Went to her new home on Sunday 18th August 2013. Evie is a pretty 3 year old brindle who weighs in the region of 26k, walks nicely on the lead and travels well in the car. 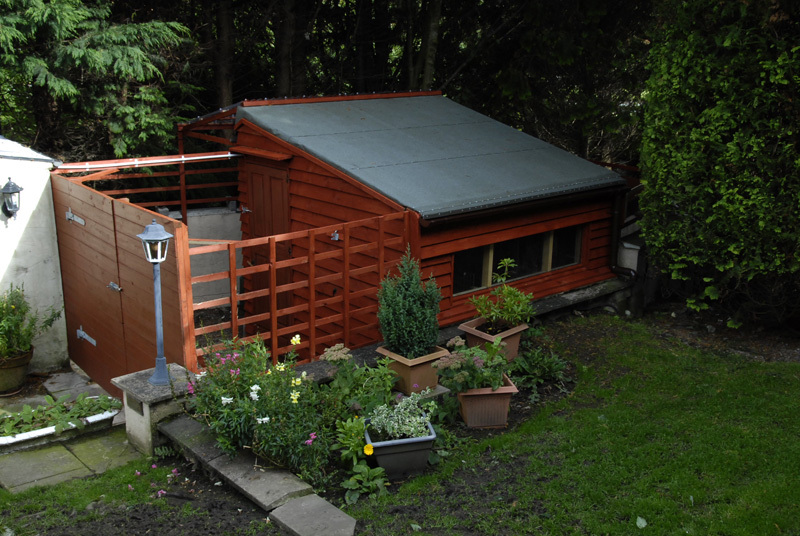 * The branch kennel at the bottom of our garden is where Evie and the other resident(s) will be for the first day or so until he gets to know the other greyhounds. He has use of our garden and paddock, and once he gets to know the other dogs he will be allowed in the house during the day and all the dogs will then take it in turn to sleep in the house at night, so they become use to sleeping in both the kennel and the house. Evie was upgraded to living in the house all the time today because 4 new greyhounds were arriving at short notice and we needed the kennel for them. Evie has been good in the house. There have been no accidents and we never heard a peep out of her all last night. She is a very friendly girl who will 'surf' the work services looking for food if you are not watching,but thankfully, this is reducing everyday, or we hope it is! She is beginning to link the word 'leave' with the water spray! Evie thinks empty coke, beer and cider cans are great fun - they make a lovely noise when chewed or tossed around the living room. Regardless to say, chewing them is not a good idea so the culprit who leaves them laying around has been asked to be more tidy! This morning Evie went to the vets for her 2nd inoculation and her spaying stitches removed. This afternoon Evie's new owner called to sign all the adoption paperwork, purchase a walking out coat for Evie and take her home. Evie remembered them and gave them a lovely greeting,but knowing something was a bit of amiss she became unsure and put her teeth to the corner of the table - a 'no', told to 'leave' and her muzzle popped on until she relaxed did the trick. When it was time to leave we helped her in the back of the car and off she went. There was one moment my heart dropped when she turned to watch us from the car window as they drove away, which made me sad, but she is going to a lovely home and we wish her a long and happy life with her new family. Although Evie is going to live in Scotand she will be a regular visitor to this area, so we hope to be able to see her again when she is passing this way. We later received an email letting us know that Evie visited Pets at Home to get her name tag after leaving us (commanding admiring glances from all, and a treat from the staff for being so well behaved!). Her next stop was the local pub in Underbarrow where again she was spoiled with doggy treats plus lots of hugs from the locals. Evie was taken a little aback when she got off the train at central station but carried on like a trooper and even endured the swerving taxi drive with good grace. So got her in and showed her around a little then straight out to do her toilet. She was then fed her and the kids gave her a good night hug. So school walk tomorrow and then vets to register her. Another busy day if I'm not mistaken! Sadly Evie was returned to us. Evie went off to her forever home this afternoon and later we received an email letting us know she's all settled, had a walk and run with Bob, a bit of tea and was currently curled up in front of fire. We received an email this morning from Evie's new mum saying she'd made herself at home, and jumped straight on to her bed this morning to say hello. This evening we received an email from Evie's new owner saying she has settled in perfectly with them all. They get a lovely greeting in the morning she gets up on her owner's shoulders like Monty used to. She loves her owner's shoes and they keep finding them all over the house. Bob has stopped crying and following everybody about, so it is a perfect match all round. Evie's owner emailed today to let us know Evie has not settled in as well as they had expected. They had a bit of a honeymoon period with her, but she is getting progressively worse. She has started bullying Bob, destroying things in the house and acts quite aggressively towards other dogs when out. Bob had a neck wound where she nipped him as he ran past her. They dont think she is a dog that can be left alone for periods of time, and they want her and Bob to be happy, which at the moment they are not. They have tried to jiggle shift patterns so they are not left alone for too long but she knows the routine of different clothes and starts to destroy things pretty much immediately. She has taken to weeing on the bed at every opportunity. Yesterday they washed all bedding, put it back on the bed and as they were talking she came straight in and urinated slap bang in the middle of it again. Evie's owner doesn't want to give up on her, but following a long chat we feel Evie is not happy and we must all work out what this is, because without doing so she will become even more unhappy and will need to come back here, which her owners didn't want. She has also started suffering separation anxiety when her owners are about to go out or are out of the house, so we suggested getting a crate for her as they can give them a feeling of security and reduces the anxiety. Her owner emailed to say Evie loved it and she was getting on much better. What a shame that Evie's owner phoned the day before we were leaving for South Africa on a well-earned holiday to let us know of the troubles they were still having with Evie. If only she had contacted me earlier I could have arranged to have Evie brought here, and for someone to look after her while we were away, but it was not to be. 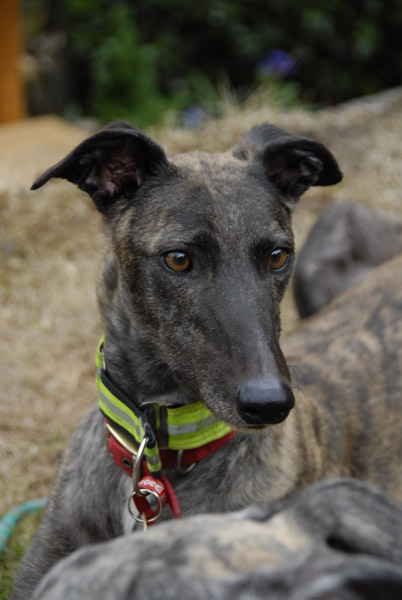 Evie went to the RGT branch in Malton, which is very close to where she had been re-homed. 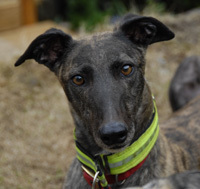 Apparently Evie trotted off with Karen, the lady in charge, wagging her tail, as she was being settled in the kennels with another greyhound. They had someone already interested in adopting her, which we hope transpired. I felt as if I'd let Evie down, but being told of her plight so close to us going away gave me no option other than to contact the Retired Grehound Trust Head Office to ask for their help. Thankfully the Yorkshire branch took her in and are going to find a forever home for her.